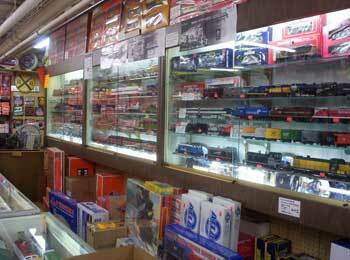 G scale (or G gauge) is a scale for model railways which, because of its size and durability, is often used outdoors. Such installations are known as garden railways. A railroad gauge is the distance between the railheads. Standard US trains, for example, run on rails spaced 4 ft 8 1⁄2 in (1,435 mm) standard gauge apart whereas some narrow-gauge railways (serving mines, etc.) have rails only 3 ft (914 mm) apart. Although built with standard-sized doors, a narrow-gauge train is in some other respects smaller than its standard-gauge cousin: its cars are generally narrower and shorter, allowing them to navigate often more sharply cornered tracks. Model trains are built to represent a real train of standard or narrow gauge. In an HO model, for example, HO track represents real standard gauge and some narrower-gauge track such as N is used to represent real narrow gauge. G model-railways depart from this and always use the same gauge. Trains are instead built in different sizes depending on whether they are intended to represent standard-gauge or narrow-gauge trains. Because of this it might be more correct to speak of "G Gauge," the consistent aspect being the gauge, 45 mm (1.772 in), and not the scale. G 'scale' is thus the use of 45 mm (1.772 in) gauge track to represent both real standard gauge trains and real narrow-gauge trains, originally those of the European 1000mm gauge, at 1:22.5. Other narrow-gauge trains are modelled at other scales. The origins of the gauge was called '1 Gauge' or 'Gauge One' which was first used in Europe and England being 1.75 in (44.45 mm). Used to model standard gauge trains in the scale of 1:32. LGB were first to adopt the term 'G Scale' and used the gauge of 45mm to model 1,000mm gauge European trains in 1:22.5 scale. Many modelers are of the notion that the term 'Large Scale' is best to describe the various scales of models that usually run on 45 mm (1.772 in) track. 'Gauge One' scaled at 1:32 (3/8" to the foot) used to model standard gauge trains of 4 ft 8 1⁄2 in (1,435 mm) standard gauge gauge. 'A' scale. Uncommon term for 1:29 scale first used by Aristo-Craft for modeling standard gauge prototypes on 45mm track. Incorrect scale/gauge but proportionally a similar size to other popular brands of the time. 'G' scale 1:22.5 used to model European trains that run on 1,000 mm (3 ft 3 3⁄8 in) metre gauge track. 'G' term is thought to be originally from 'Gross' or 'Garden' by LGB who popularized the scale. 'H' scale (Half inch) 1/2" to the foot scale. 1:24 used to model 3 ft 6 in (1,067 mm) gauge or 'Cape gauge.' Incorrect scale used for 3 ft (914 mm) gauge track. 'F' scale (Fifteen) 15mm to the foot scale. 1:20.32 Correct scale/gauge typically used to model North American narrow gauge trains on 3 ft (914 mm) gauge track. 'Seven Eighths' 7/8" to the foot scale. 1:13.7 used to model trains on 2 ft (610 mm) narrow gauge track. '16mm scale' 16mm to the foot scale. 1:19.05 Originally intended for modelling 2 ft gauge prototype railways on 32mm track (SM32). The models are often re-gaugable to also run on 45mm track. This scale has also been used to model 2 ft 6 in (762 mm) gauge prototype trains.